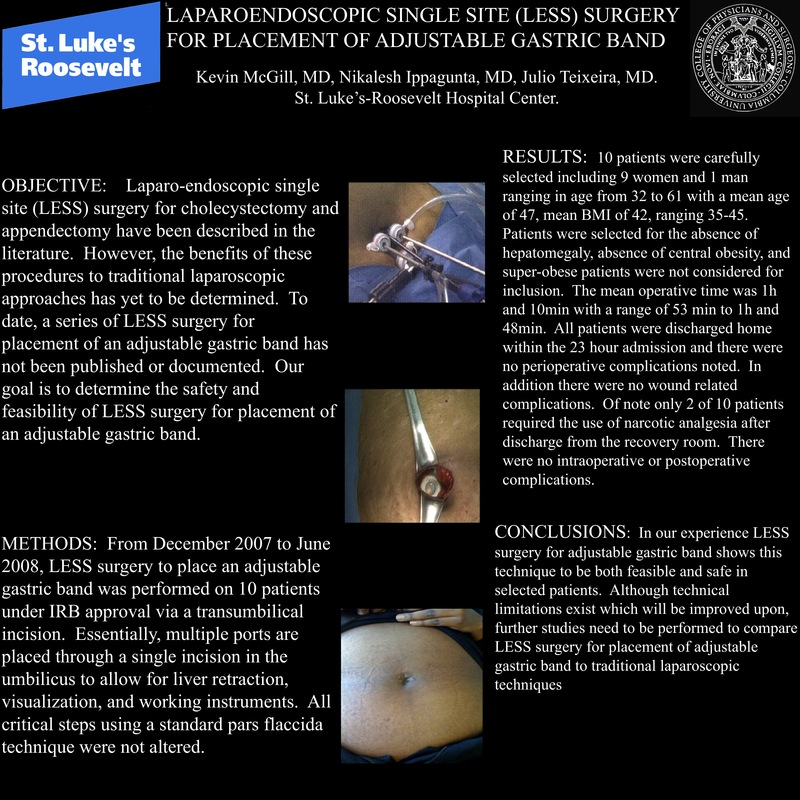 Objective: Laparo-endoscopic single site (LESS) surgery for cholecystectomy and appendectomy have been described in the literature. However, the benefits of these procedures to traditional laparoscopic approaches has yet to be determined. To date, LESS surgery for placement of an adjustable gastric band has not been published or documented. Our goal is to determine the safety and feasibility of LESS surgery for placement of an adjustable gastric band. Methods: From December 2007 to June 2008, LESS surgery to place an adjustable gastric band was performed on 10 patients under IRB approval via a transumbilical incision. Essentially, multiple ports are placed through a single incision in the umbilicus to allow for liver retraction, visualization, and working instruments. All critical steps using a standard pars flaccida technique were not altered. Results: 10 patients were carefully selected including 9 women and 1 man ranging in age from 32 to 61 with a mean age of 47, mean BMI of 42, ranging 35-45. Patients were selected for the absence of hepatomegaly, absence of central obesity, and super-obese patients were not considered for inclusion. The mean operative time was 1h and 10min with a range of 53 min to 1h and 48min. All patients were discharged home within the 23 hour admission and there were no perioperative complications noted. In addition there were no wound related complications. Of note only 2 of 10 patients required the use of narcotic analgesia after discharge from the recovery room. There were no intraoperative or postoperative complications. Conclusions: In our experience LESS surgery for adjustable gastric band shows this technique to be both feasible and safe. Although technical limitations exist which will be improved upon, further studies need to be performed to compare LESS surgery for placement of adjustable gastric band to traditional laparoscopic techniques.